As some of you may know, I bought a Worsley Works etching of a LSWR 3-Sub some while ago, and it is now time to build it in early Southern Railway guise. In respect of how the finished unit should look I feel reasonably confident: I have quite a number of drawings, photographs and reference books, and will use Phoenix Precision Paints. The livery will be early SR. If anyone is interested, the set is made up of the following (with page numbers referring to drawings in Brain Goulding's book 'A Pictorial Record of Southern Electric Units'). 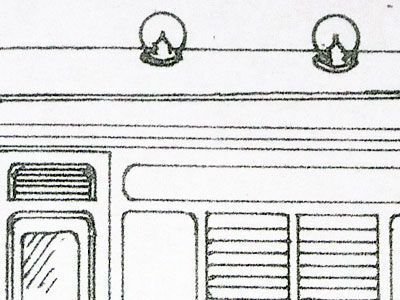 The etching for the lower half of the cab-front has been made in small, vertical strips. I guess this is to help form the curve of the cab. What will be the best way to form this? Should I tin the area with solder first and then use the heat of the iron to melt it all together and then file it to smooth/round it of off? I guess some sort of pre-shaped wooden-former would be helpful with this? And then there are the bogies / springs / axle-box parts of the etching. What's the proper way to approach these? I've never done this before! 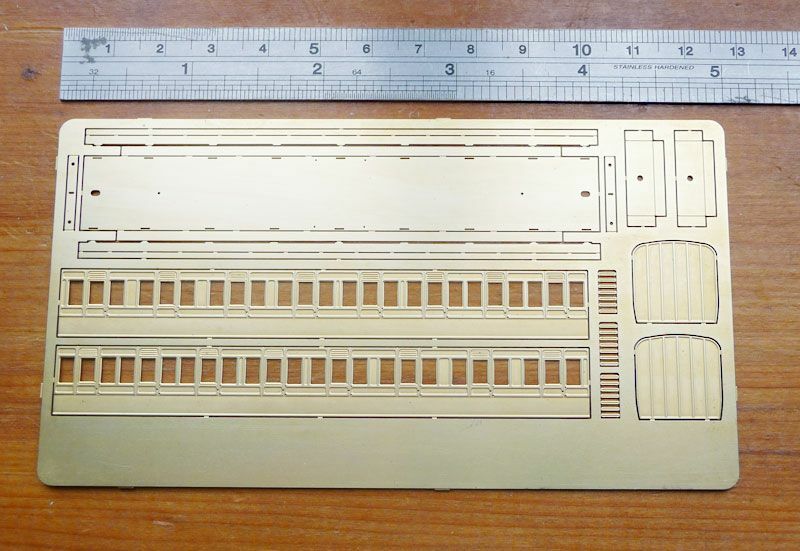 Overall I am very excited about this project - but at the same time have next-to-no experience with constructing brass etches. In this respect I hope I can draw upon the knowledge and experience of forum Members to help see me through my first attempt. 1) A motor in the trailer carriage. 2) A motor in the driving unit, hopefully concealed within the guards compartment, and not protruding into the driver's cab. The bogie wheelbase needs to be a scale 8'. I thought about using the chassis from a commercially available N gauge diesel or electric loco - but none seemed to match wheelbase and overall length (scale 49') - and neither did any look like they could be adapted. I could do as I did before with my Farish hack job and use the motor from a proprietary DMU, but that is a very expensive and wasteful indulgence to discard everything else just for the sake of a motor ... and longer term I'd like to find a more elegant and consistent solution to motorising my EMUs rather than one-off 'smash and grab' jobs unique to each unit. Like Henry Ford - I like standardisation - it just seems to make sense. For the driving car I can't use a motor from a diesel or electric loco because the driving bogie wheelbase is 8.6", but the non-driving bogie is 8'. btw - the internal height and width of the units is more-or-less 14mm square. So whatever means of motorising I go for needs to fit within this space. To my knowledge no one now makes transfers for pre-war Southern passenger stock. If anyone can suggest a reliable and willing supplier of bespoke transfers I'd be much obliged if you would let me know. I once had a (failed) attempt at making a 4-Lav. It was painted by hand and I was very pleased with the finish (even if I do say so myself). But what are others thoughts on hand-painted v. airbrushing ?? Half of me quite likes the notion of hand painting (as the originals were - it has a certain quality to it) ... but as with everything in this post, I am looking for the more experienced amongst you to guide me through this project if you don't mind. I'm fairly confident about sourcing the remainder of detail items for this build - but two things I'm not sure about are Grab Handles and Door Handles - can anyone suggest a source? Similarly, the doors are not etched into the sheets so will need scribing. Can anyone suggest a good tool for this purpose? I'd guess that solder paint is the best option - paint the various layers with the paint, clamp them together, and then apply the soldering iron. Option 2 seems ideal for my purposes - I can have whatever suits me - but the bespoke option means I have to wait 6 months (Yes, 6 MONTHS!) for delivery - does anyone know how to circumnavigate this? You could try ordering direct from Hollywood Foundry in Australia and cut out the middle man, but this may work out more expensive when you have to pay VAT plus the £9 (or whatever it is) the Post Office charge you for collecting the VAT. Do I take a spring thing with hole - then a box thing plus hole, and then a box with no hole and put them on top of each other? And where do the 'half-height' bits come in? The thing with Worsley Works 'scratch-aid' kits is they come with no instructions or literature - but just the etchings. So the rest is left up to you to work out. And I'm afraid I've never done this sort of thing before (but am keen to learn) ... so I have to rely on the experience of others to guide me through my embarrassment of not quite knowing how some of these parts are supposed to go together. Welcome to Kitbuilding and Scratchbuilding! I've never made anything like this (very well) so cant really help with the build (but will eagerly look and learn and send some dark glances over at my unbuilt etches box) but with I can with the transfers. They do a custom transfer service using ALPS/OKI printing - so it might be worth contacting them directly. 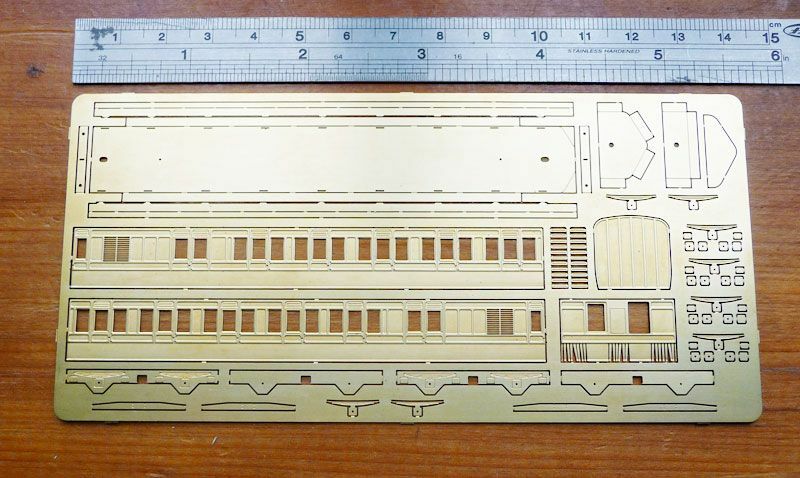 Looking at the bogie parts, I think you would be wise to get hold of something better than those etchings. I know the 2mm Scale Association have useful stuff, but you need to be a member - or know a nice friendly member - to buy. Not sure if the NGS have anything useful - or maybe Etched Pixels/Ultima? For the curved parts at the front around the cab, you might be best using filler and filing down. TPM used to do a motorised chassis kit for railcars. Again, not sure if it is still available. If you are not too worried about the bogie wheelbase, Tomytec and other Japanese motorised chassis may be useful - they are regularly available on Ebay and moderately cheap. Those bogie etches do look a little strange. The small holes look to be there to string together the various layers using brass wire or similar. 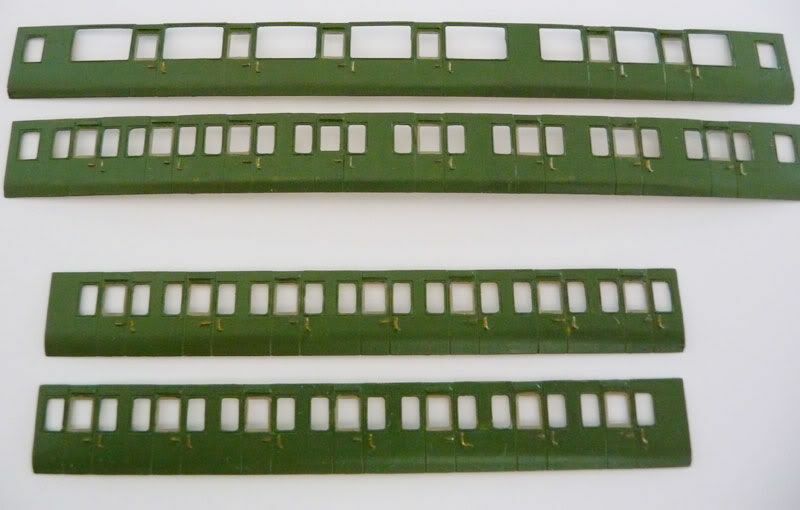 However the detail on the bogies, in contrast to the bodywork, doesn't look that great, and, more importantly, where are the bearings going to go, and where are the ends, which will hold it to gauge? If I were you I'd have a look to see if Ultima or the 2mm Association do an appropriate bogie? 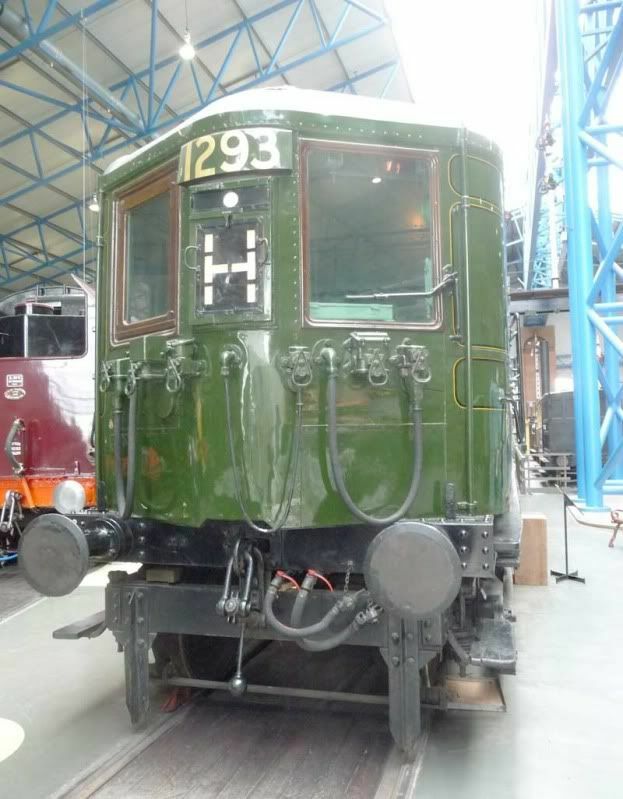 I don't really know much about pre-nationalisation SR EMUs, but there is an SR bogie from the 2mm Assoc. as well as the Fox bogie, which is a reasonably "standard" pre-grouping bogie. http://www.2mm.org.uk/products/shops.php?shop_num=3 These bogies are very nicely designed around a fold-together frame, with the bearings acting as a 'peg' on which to hang all the extra detail. Looking at the cab fronts, its hard to work out whats going on there. It looks like its trying to help you form an inward curve, but looking at photos of the NRM 3-SUB, the front is actually quite vertical! I imagine you're going to end up with a lot of Miliput around here. I'm currently working on a Worsley class 309 "Clacton" EMU, which should have some similar curves around the front, which I'm planning to just sculpt from filler, using the etch underneath as just a frame. It might be worth asking Alan what his intention was with this? The new N Gauge Society SR passenger bogies would be correct for quite a lot of SR units, though I suspect if these are ex-LSWR they may have something that looks more like the 'Fox' bogie. 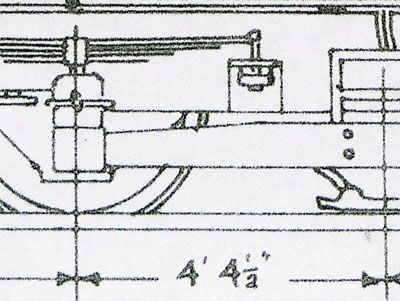 If you compare the LSWR motor bogie http://www.semgonline.com/gallery/lswremu.html with those under the early 4-CIG http://www.semgonline.com/gallery/class421_04.html you can see how little of the main bogie frame changed over 50 odd years (later 4-CIGs were different though). Unfortunately that's one of my (too many) stalled projects. Looking at the etch, I think that the parts are grouped together. So you have a spring, then four pieces underneath it which are laminated together to form the axlebox. The top layer has no hole in it. The two pieces either side of the spring on the etch (the half height parts) are possibly meant to be soldered under the end of each spring - there's a half etched position to the side frame that's about the same size. But I'm not sure why there are extra side frames, and extra springs and two sets of shoe beams. Possibly the are meant to be laminated together for strength and to give an extra level of relief. I've not seen bogies made this way before, but you do seem to have the parts to produce a set of cosmetic side frames for the motor bogie. I can't help with powering the kit as I've not built anything like this although there are numerous options from the likes of Tomix and Kato which may help. There are plenty of members on here who build EMU/DMU's who can better advise. The coach bodies. Alan Docherty designs them to go together in a similar way to the Comet coaches so a look through the generic instructions on their website would probably prove useful. As for bogies, the 2mm Association do both SR steam and Fox pattern bogies. Both take 12.25mm axles, N gauge versions of which are available from the shop. Association bogies make up and work beautifully - I have built a couple of dozen now. Personally I tin the various layers before sweating them all together - I've never got on with solder paint. I'll be digesting and researching over the next few days and will be back with any further questions / progress. Apologies for brevity of response - first day back at work today and already life has got horribly hectic again! Mark, I admire your determination to build this. I'm in a similar position to you in that I have never build an etched kit before, but eager to try it out. 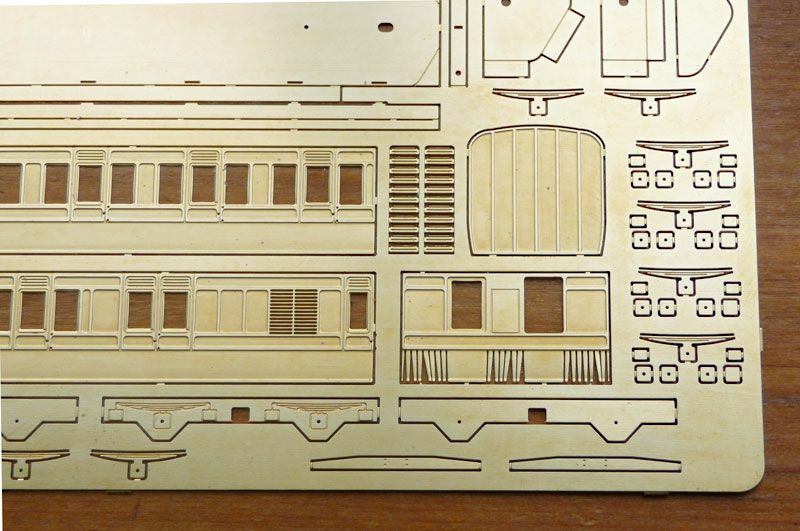 I would be inclined to practice building a few pieces of rolling stock in plastic, then plastic and ettched details before attempting anything which a full etched kit, particularly in 2mm scale. 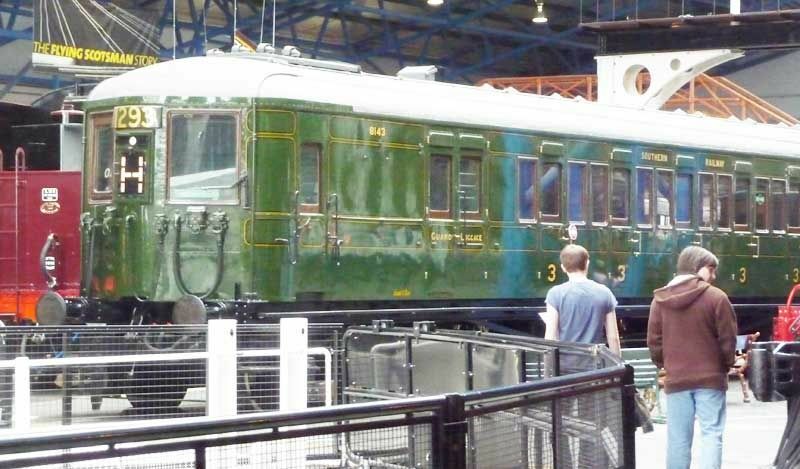 Here's a couple of pictures of a later version of the unit I intend to build (Pictures taken at the National Railway Museum, York). There are two main differences between this and my build - on the earlier version the lower cab-front curves under quite noticeably, and the section between the driver's door and the guard's and luggage doors have ventilation grills. The LSWR ones were also shorter, but lengthened later when rebuilt on standard SR underframes. thanks for your replies - all very much appreciated. Here's an update - and my shopping list for parts, the latter being as much 'notes to self' as it is some queries I have. Please take a look - any thoughts, suggestions and dire warnings are welcome. 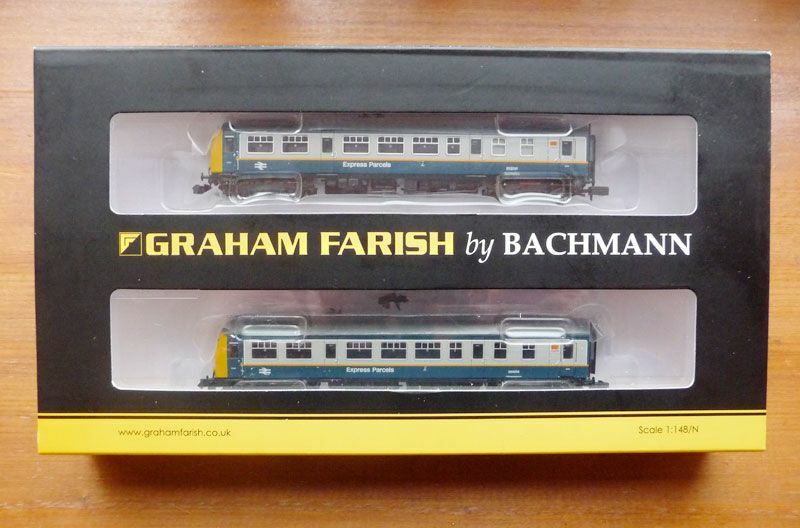 So I've had a week to think about the motor, and will go for the Farish 101 DMU Parcels Express, which comes with two motors. Does anyone know if both bogies on each carriage pick-up power - or just one on each carriage? If the latter I may add extra pickups to the second bogie on the power car. That's assuming I can get insulated wheels (?) Can anyone recommend a source? And I'll need to buy pickups for the wheels too. Do I need to buy nuts and bolts to fix the bogies to my carriages? I also need fine profile wheels. Etched Pixels supply them I think UM181 Does anyone else makes them? The doors are not represented on the etching - any recommendations for a scribing tool? I can't find anything suitable - so I'll make do with fuse wire chopped into short lengths unless someone knows better? For the domed cab fronts I may use Balsa. Slithers of self-adhesive address labels. Not sure about these - I see Etched Pixels do some so I'll take a look in more detail. Any other suggestions? Between units I'll either close-couple with the standard couplings, or possibly make my own. But I've been thinking for a while that I should decide on a discrete method to standardise across all my stock. Would D&G generally be considered neat and reliable? I have etched couplings for the facing end of the units. I have etches to build three units in total. And I thought it would be interesting to have one in LSWR livery and two in early SR livery. (I think the latter is a mid grey, ie. a weathered / darker colour, rather than the white roofs as the units appeared from the workshop as-new - but I'll have to check). When it comes to varnishing the carriages I think a satin finish would look right, whilst for roof and bogies etc a matt finish (plus weathering). Well I think that covers everything, I hope there's nothing overlooked. Thanks for listening, and any thoughts welcome. Thanks Nick, that's useful to know. One of the things for me to think about here is that the leading and trailing bogies on the three car units were motorised, with 8'9" wheel base bogies, whilst all the other intermediate bogies were 8' wheelbase and un-motorised. So really I should fit my own 8' (but power-collecting bogie) at the trailing end of the carriage which houses the motor in order for it to look right, and give me the reliable running I hope for. I can be thinking ahead on the options now ... thank you. As to your own work - do you have a work bench or layout thread? forgot to mention in my post the D48 the Ford rail Car and a SECR continental coach............................. . I normally make roof domes using a combination of thin plasticard formers and Milliput fine white filler. Assuming the main roof is done, start by putting in the 'guide' profiles for the domes, then add the first lot of filler to below the profiles, just to give everything strength and support and, when set, the next application is shaped it to match the profiles while it is still fresh and workable, using a lot of wet and something smooth, flat and hard - e.g the back of a knife blade. This stage should get you close to the final finish. Some Southern units have fairly sharp angles between the roof facets and this method achieves this very well. Thanks Nick, I realise I have been watching that thread and there is some nice work on there. Thank you again Bernard, you are a mine of information! That's a neat technique for domed cabs and one I will probably try. I used the technique for this 2-BIL cab end, though given the new Hornby-Arnold plans, I don't think this is a goer any more. However, there are other units with very similar cab ends, so I think with modifications to the profile, most of it could be useful still. This cab-front is magnificent Bernard. Truly painstaking work. This is N gauge right ? And all using Plasticard / Plastic Rod ? I don't know how you've done it ... the fine detail (including whistle and wiper I note), the crispness, accuracy, and precision of line, it is an incredible quality of modelling. I looked at this picture last night, and have been looking at it again for at least half-an-hour this evening - and I'm still quite staggered to be honest! Thanks. It is N (so shown about 5x size) and plasticard and rod and a bit of filler too, but it won't compare to the Arnold 'Belle', I'm afraid. And I'm guessing a 2-BIL might follow - hence the requirement for a Plan B. Having said that, the simplest Plan B would be the first 10 2-BIL units, so maybe not all is lost, and most of it is the same as the 4-LAV and Eastern Section 3-SUB. The plan was etched sides and possibly resin roof and inner ends, but the last few years my completion rate has become glacial and I've had supplier problems that have got me down a bit. That said, the N Gauge Society Southern bogies are a help. Thanks. https://www.rmweb.co.uk/community/uploads/emoticons/default_blush_mini.gif It is N (so shown about 5x size) and plasticard and rod and a bit of filler too, but it won't compare to the Arnold 'Belle', I'm afraid. And I'm guessing a 2-BIL might follow - hence the requirement for a Plan B. Having said that, the simplest Plan B would be the first 10 2-BIL units, so maybe not all is lost, and most of it is the same as the 4-LAV and Eastern Section 3-SUB. The plan was etched sides and possibly resin roof and inner ends, but the last few years my completion rate has become glacial and I've had supplier problems that have got me down a bit. That said, the N Gauge Society Southern bogies are a help. A 101 Parcels Express unit arrived and has been run-in on the layout to ensure the motors are in good working order. I got it at a good price in the January sales - and even better, a member of this forum has offered to buy the parts I will not be using, thus ameliorating the cost even further. I've been hanging-on for the last couple of years for the arrival of the N Gauge Society SR 8' Steam Bogies before commencing this project. But a few days ago I suddenly realised that my units pre-date Southern Railway ... I don't need SR bogies, I need LSWR bogies! Doh! Is it best to fix these before curving the carriage-sides to shape, or to build the carriages first, and then fit door and grab handles? Which way round do others usually do this? Any other hints and tips regarding door fittings? spent the afternoon soldering Door grab rails to a Worsley etch (after the varnish on the rail car ran the paint , which is now sitting in antiseptic stripping ). I assume your only using one of the powered bogie so whats the next project?